Tired of seeing your deck look like this? 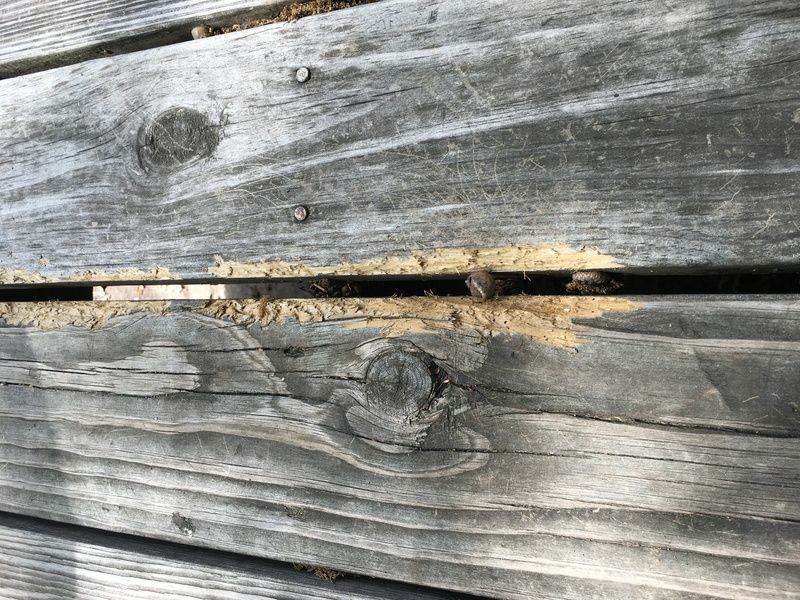 Left unchecked, nature's assault on a wooden deck will cause it to warp, gray and become a haven for mold growth. Moisture, pollen, and the sun can all wreak havoc on wood. You may have tried to perform maintenance by cleaning and applying a sealer, but with the same end result. Finish failure is a combination of factors. The key to success lies in starting with a thorough deck cleaning. 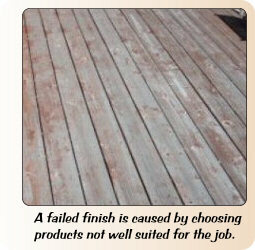 Improperly preparing the wood or using the wrong type of deck stain sets the finish up for failure. You may be spending too much of your valuable time just spinning your wheels. Home Centers: The Place To Buy Deck Cleaning Products? Most of the deck cleaners you find in home centers are merely inexpensive household bleach (look for the chemical sodium hypochlorite on the label) mixed with a little soap. Examples would be the Olympic pictured left. 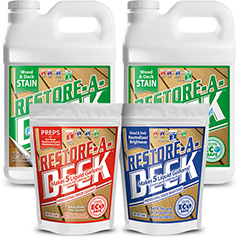 These products may remove mold or mildew but they do nothing to address removing a failed finish, removing gray or pH balancing a deck to prepare it for staining. The first stage that needs to be done is deep cleaning. Bleach based cleaners cause unnecessary damage to wood. When viewed microscopically the wood fibers become a jumbled mess that makes it difficult for stain to penetrate. Bleach also causes an unnatural whitening and drying of the wood. A much safer alternative is a sodium percarbonate based product. Sodium percarbonate is a precursor to hydrogen peroxide and is classified as a mildewcide. When mixed with water you get a solution that will penetrate the wood and kill the mold spores. The oxygenating power of this landscape friendly, user-safe chemical will bubble dirt that is trapped in the wood to the surface. This action is much milder on the wood and causes far less long term issues than the inexpensive cleaners that contain bleach. 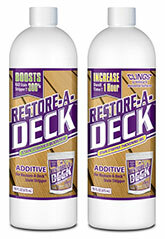 Restore-A-Deck's Step-1 cleaner takes the concept further. 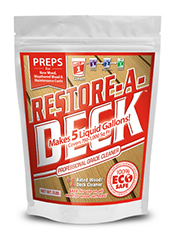 The addition of five other cleaning agents and surfactants work to emulsify any stain that may remain on the deck. 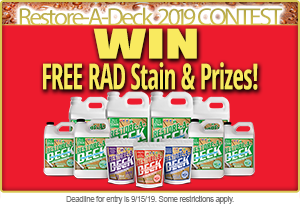 RAD's step-1 will also loosen gray fibers meaning with mild brushing or a pressure washer used at very low pressure you will be able to move quickly through the cleaning process. You get the cleaning power of much stronger chemicals without the risk to yourself, pets, children or your landscape. The second part of the process is equally important. This step is what sets a professional preparation apart. The first stage of cleaning will leave the wood in improper pH balance. Prior to staining or sealing the wood should be slightly below neutral (acidic). Mold does not thrive in acidic environments, so this is further insurance against leaving any spores in the wood. Mold is the number one destroyer of deck finishes. The second step has additional benefits. Before your eyes, you will see the wood brighten. The transformation is almost magical. At this point, the wood is restored and will dry to looking much more like new lumber. 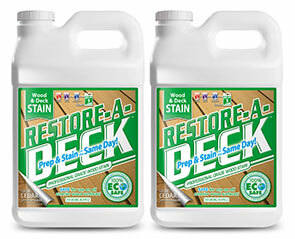 Your deck will now be "open" to accept a high-quality staining product. 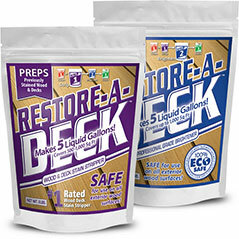 In designing the Step-2 of the Restore-A-Deck restoration kit we sought just the right blend of acids. Many products like Cabot's Problem Solver brightener contain straight oxalic acid. This is a harsh acid that is irritating to a person's lungs and will etch metal quickly. We found a combination that includes citric acid that is far less irritating to bronchial passageways and is not nearly as harsh on the wood. Your stains will last longer because you performed the proper preparation. Eliminate the need for pressure washing. A scrub brush and garden hose do the job. You will spend as little as $.07 per square foot by doing the project yourself. A professional contractor will charge you six to ten times that amount in labor alone. Read this testimonial from Vice President George Guy after he tried a sample. 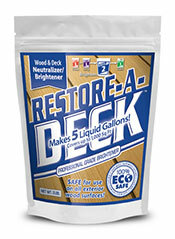 East Teak now recommends Restore-A-Deck to all of his customers. "Restore-A-Deck is FANTASTIC!!!!! I applied your 2 step product to my deck last week. This would be considered new construction I guess as the deck was installed in late November. I used a regular hose.. not a pressure washer. I had much enjoyment watching the dirt and scum bubble up. I would not have thought that much dirt could have possibly been in the grain. A valuable learning lesson for me. After the cleaning, I went to step 2 and again the same end results. Beautiful prep work for my [stain]. 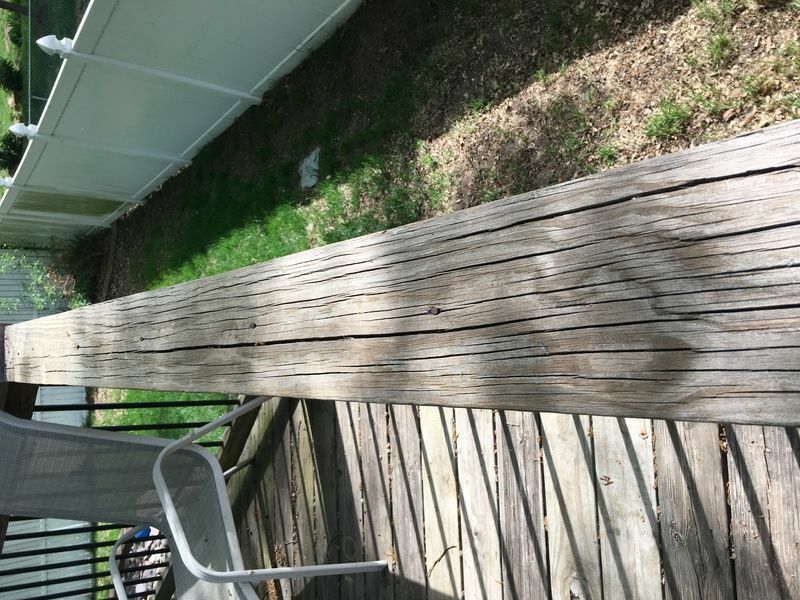 I will be sure and tell everyone I sell to that they certainly need to seriously consider having Restore a Deck on hand to complete their deck jobs. Keep up the good work. No need to stain underside of a deck. my deck and I have this sappy sticky stuff which gums up the sandpaper when sanding it. Do I need to get it off before using the cleaner? I’ve attached a couple pictures. That is sap leaching out of the wood. It should be removed if possible before staining. Will the RAD cleaning product remove it or is there another way to remove it? Sanding it doesn’t appear to work well. No, it will not remove it. Not sure what will. 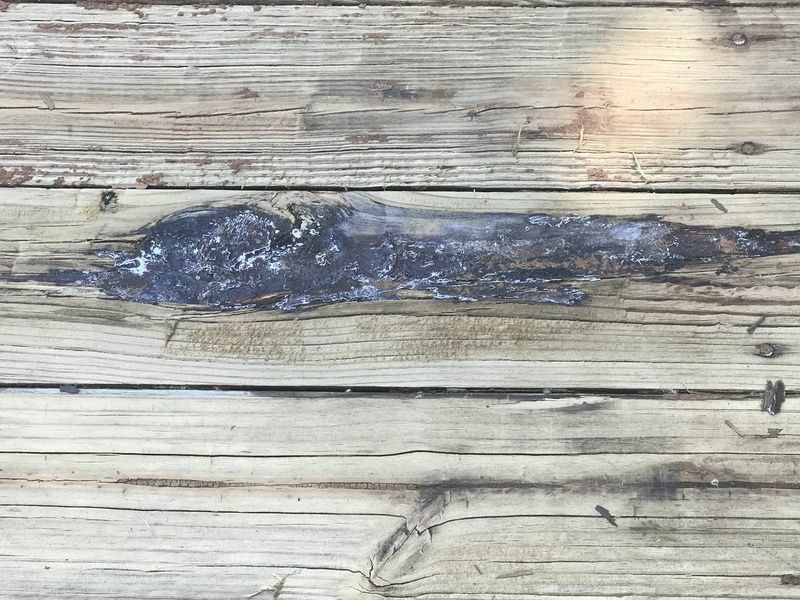 Try a google search on removing sap from a deck board. If it is only a few boards, you might want to consider replacing them. 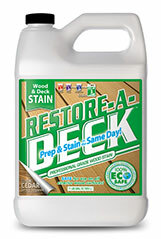 I've used the RAD step 1 & 2 cleaner/brightener plan and will be using a RAD stain in a few days. Do I need to add a sealant over the stain for added protection? No need. Just an FYI, you cannot add a deck sealer over the top of a deck stain. It will not work or soak in. Hi, newbie to deck refinishing/staining. 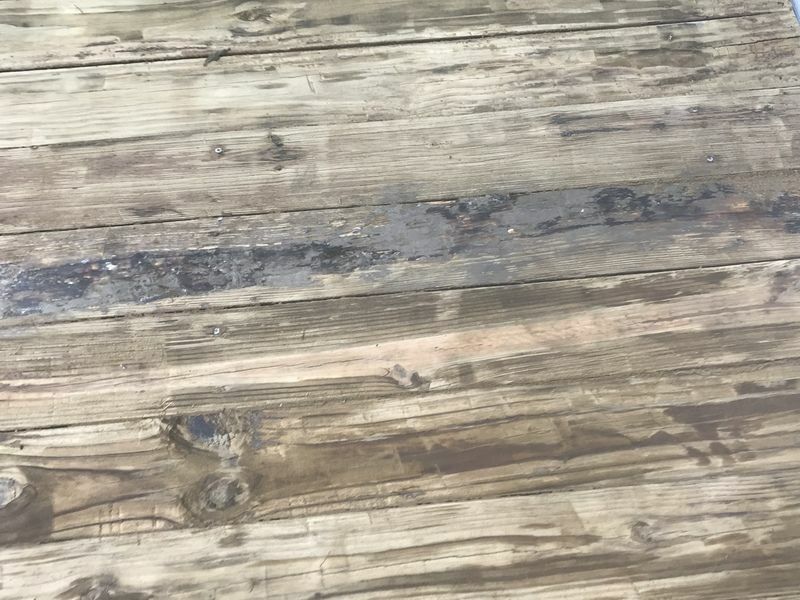 From tutorials I’ve read online it says after you clean/brighten you should sand down rough spots in boards, replace any as needed, then stain. Can we do the clean/brighten/sand steps, and then stain a few days later? The reason I ask is because the days we were hoping to do it (and would have help), it is supposed to rain. Or is cleaning it too early moot, because we would have to clean it again to get pollen/leaves off (a large oak tree hangs over the deck)? Including a few pics to show the boards I think we need replaced. we ordered the RAD clean kit and should be here today. If it rains between prepping and staining, just wait a couple of more days after the rain for the wood to dry. I cleaned prior year's TWP 1500 stain with RAD cleaner by power washing and then applied and rinsed off RAD brightener and have waited 2 days for drying. It appears most of the stain has been removed. Do I need to sand treated pine before I apply a new coat of TWP 1500 stain?